The mountune Turbocharger Upgrade Down Pipe has been engineered to reduce exhaust back-pressure at the turbocharger allowing faster response and additional power. Features include an optional large diameter (5”) motorsport type, 200 cell count metal substrate honeycomb catalyst to ensure effective, ultra high flow performance in extreme environments. Large catalyst cross section means increased exhaust flow. Constructed of 3” AISI 304 Stainless Steel mandrel bent tubing with a CNC machined V-Band flange that allows easy installation. Additionally, robust factory type mounting brackets and hangers are utilized to maintain perfect alignment and OE like fitment. We also incorporate an 8” stainless steel Flex Section to help absorb shock and prevent OE hanger failure. This product is for off road and motorsport use only. Optional large diameter motorsport type, high flow 200 cell count catalyst - Larger than the competition- ensures higher flow rate. 8” Stainless Steel Flex joint-will not damage lower exhaust hangers like others on the market. 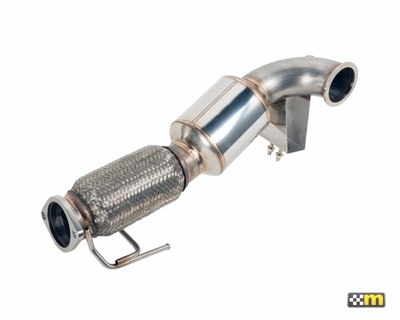 For use only with mountune Focus ST Turbocharger Upgrade. Not compatible with stock turbocharger. I have not had a chance to get this product installed yet as I am out of the country, however, my experience with mountune as a whole is not good. Their customer service is below poor, you have to stay on them to make sure you stuff even ships. The down pipe shows will ship in 48hrs when I placed my order. Approximately 15 days later I had to contact Mountune to find out why my stuff hadn't shipped. They didn't have a reason. Changes need to be made in their logistics channels. Once I get my part installed I will adjust my review as necessary. The EFR downpipe was an amazing quality build. There were some fitment issues with the first unit sent. It caused some installation issues but Mountune stepped up and offered immediate replacement of the unit once notified. So with that I have no problems with the unit - matched up great with the Mountune catback exhaust I already had. Sound is great, no drone, and a bit more throaty.